Les Zaitz talked about his open-records battle after accepting the Tom and Pat Gish Award at Lewis & Clark College. Les Zaitz, publisher of the Malheur Enterprise in eastern Oregon, made those and other points Thursday as he spoke to the annual conference of the International Society of Weekly Newspaper Editors in Portland and accepted the 2018 Tom and Pat Gish Award for courage, integrity and tenacity in rural journalism from the Institute for Rural Journalism and Community Issues, publisher of The Rural Blog. Zaitz talked about how the Enterprise pursued the story of a former state hospital patient’s involvement in two murders and an assault in Malheur County shortly after his release. The newspaper discovered that the defendant had been released after convincing state officials he had faked mental illness for 20 years to avoid prison, and after mental-health experts warned he was a danger. The state Psychiatric Security Review Board sued Zaitz and the Enterprise to avoid complying with an order to turn over exhibits that the board had considered before authorizing the man’s release. Zaitz started a GoFundMe effort to pay legal fees, but then Gov. Kate Brown took the rare step of interceding in the case, ordering the lawsuit dropped and the records produced. He said lessons from the episode include: "Even if you’re small, don’t back down from a fight like this. . . . Success in a fight like this depends a great deal on your institutional credibility; they knew that once I sank my teeth into their ankles I wouldn’t let go, because of their experience in prior instances" when he was a reporter at The Oregonian in Portland. Probably the most important lesson, Zaitz said, is to "bring your community along as the fight heats up. Let them know that we’re not doing it for journalistic prizes. … tell the reader, we’re doing this for you' this is information you deserve." He said the news media have done "a terrible job as a profession of bringing our community along and explaining the profession," but people are still thanking him for taking on the state. "This fight, and the success and the propose of it, to me, was in the pursuit of the finest ideals of the profession, the pursuit of truth and justice," he said. "We have to always never, never relent in the face of opposition from government. If we don’t stand up to the government, who will?" Zaitz said the board's new executive director is moving to again restrict access to such records, so "I don't know what kind of brawl I've got ahead." "I was on a glide path toward retirement at The Oregonian and the last thing I needed was another major assignment," Zaitz said, but he lived in the area and was the natural point man. The standoff lasted 41 days, and Zaitz led the coverage of it, but he said the experience has lessons for smaller newspapers like Harney County's weekly Burns Times-Herald, the paper closest to the refuge, which "decided to stay our of the coverage for the most part" though Burns was "overwhelmed" by the influx of militia types, news media and law enforcement. "Your access is one of your primary advantages" in covering a big story, Zaitz said. You’re known in your local communities; you are presumably trusted. … Even in the face of a major news event, where you are being swamped by out-of-towners, that is an asset you cannot overlook." To stay on top of the story, you must report it when news happens, Zaitz said: "You have to own the audience … online, driving information out. … We reacted to rumors; we would go online and knock those rumors down. … It just makes you indispensable to your audience." Think ahead, he advised: "Plan for a major news event. . . . It will pay huge dividends." Ask questions such as, "What’s your battery supply? Where do you get water for your reporters in the field when the water is contaminated?" 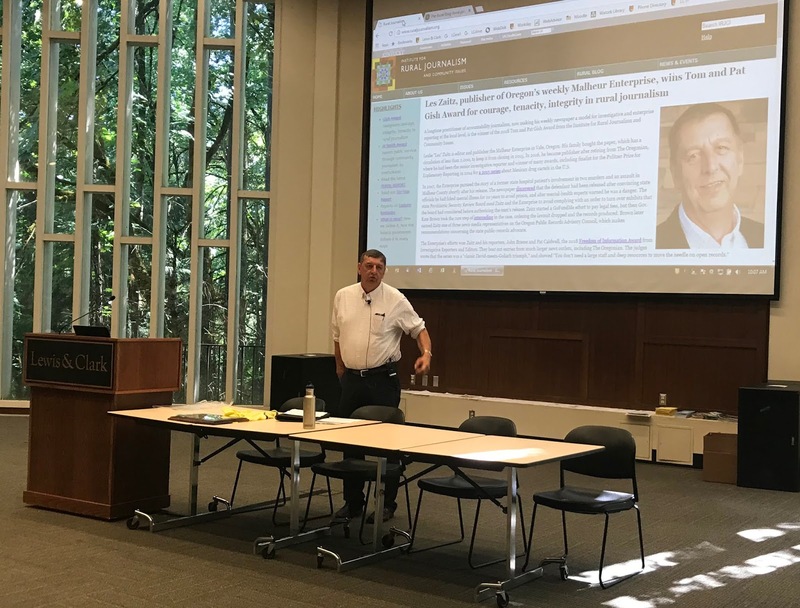 Turning such challenges into opportunities is essential for local news media, Zaitz told the weekly editors, meeting at Lewis & Clark College: "In the current environment, what we do has become so important that our societies are turning to local news as, frankly, the only news that they can trust. That’s a major, major issue in this day and age. … they know you, they know your organizations, so you need to help build that trust, and build on that trust, to give … some refuge from the storm of fake news. People are feeling whiplashed, they are feeling misled." Zaitz said his experience as publisher of the Enterprise, where circulation has doubled to 1,500 since his family bought it in 2015 to keep it from closing, has affirmed his core belief "that readers wanted nothing more than solid, local information" about how their tax dollars are being used. He said he told a reporter not to spend three hours at a school-board meeting, but spend that much time finding out why the local high school's graduation rate is declining. "I don’t care if you’re small, you can still be good, and you can still be effective," he said. "We can make a difference and turn this around if we all collectively step up our game." In small towns across the country, Dairy Queen provides not just restaurants, but community water coolers where locals can talk. 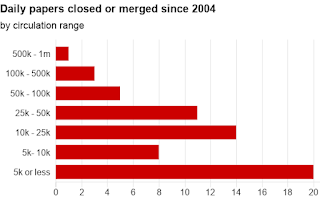 But in Texas, as the rural population shrinks, many small-town Dairy Queens are closing, while the company expands in metropolitan areas like Houston and Dallas. 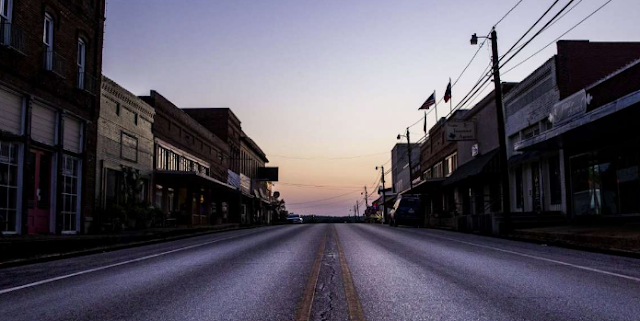 A hauntingly beautiful article and photo essay by Emily Foxhall of the Houston Chronicle explores the role Dairy Queen has played in the lives of rural Texans and what they'll do without one nearby. Brookings Institution map; click on the image to enlarge it or click here to see the interactive version. A new economic analysis, complete with an interactive map, by the Brookings Institution breaks down how where you live affects your earnings, based on factors such as occupation, income-tax levels, age, and cost of living. Metropolitan areas, unsurprisingly, tend to have higher incomes than non-metro areas, with few exceptions. The analysis also examines "some of the reasons why places have such different labor markets. When a place seems too good to be true (i.e., with high wages across the board and low cost of living), what could account for its seeming advantage over the rest of the country?" Lauren Bauwe, Audrey Breitwieser, Ryan Nunn and Jay Shambaugh report for Brookings. Economists consider such factors as part of what influences a worker's choice of where to live. "China's retaliatory tariffs on U.S. soybeans, threatened for weeks and enacted Friday, have driven down prices and triggered a wave of bargain shopping by importers in other countries stocking up on cheap U.S. supplies, according to a Reuters analysis of government data," Karl Plume reports for Reuters. China, which buys two-thirds of the world's soybean exports, bought an average of 60 percent of all U.S. soybeans over the past decade, but so far in 2018 has bought only 17 percent. Instead, China is buying mostly Brazilian soybeans. Meanwhile, U.S. soybeans prices have fallen 17 percent over the past six weeks to about $8.50 a bushel, their lowest price in almost a decade. That's triggered a 127 percent jump in advance purchases of the next U.S. soybean crop over last year's figures. One of those customers is Brazil, the world's top soybean exporter; it normally doesn't need U.S. soybeans but is buying them to use domestically (mostly in cooking oil and animal feed) so it can export more soybeans to China. "The decline of China's purchases of U.S. soybeans and the jump in those from other countries amount to a collective bet against any swift resolution of the escalating trade war between the world's top two economies," Plume reports. China has targeted President Trump's voting base with tariffs on agricultural products like soybeans, but its willingness to levy tariffs on American energy exports such as crude oil, liquefied natural gas, and refined energy products, sends some complicated messages, Meghan O'Sullivan writes for Bloomberg. Bringing in enough energy imports to fuel its economic growth has been a Chinese priority since the 1990s, so China's willingness to create obstacles to that objective suggests several things. For one thing, it looks like China thinks (probably correctly) that the energy tariffs will probably hurt the U.S. more than they will hurt China, O'Sullivan writes. It also suggests that China is confident that global natural gas markets are going to be cheap and abundant for the foreseeable future. "Alternatively, the Chinese may have decided that, whatever the costs, they are not comfortable relying on the U.S. as a source of one of their most strategically important commodities, regardless of the financial risks that such a decision may entail," O'Sullivan writes. Besides hurting U.S. businesses, Chinese energy tariffs could also "strike one item off the rapidly dwindling list of areas in which the U.S. and China can identify common interests and see value in cooperation." "Eight former supervisors and safety officials for Kentucky coal mines were indicted Wednesday on charges that they lied to or misled federal regulators about the amount of harmful coal dust workers were exposed to," Dave Jamieson reports for HuffPost. "Russell Coleman, the U.S. attorney for the Western District of Kentucky, said that officials at now-defunct Armstrong Coal routinely submitted phony records to the Mine Safety and Health Administration in an effort to downplay the amount of coal dust in two of its mines. By doing so, the company would have concealed the true risk of its miners developing pneumoconiosis, better known as black lung disease." Mine operators can mitigate coal dust with better ventilation, but that can cause delays in production. Miners are often uncomfortable about speaking up about dust fraud for fear of losing their jobs or being blackballed. So, while the Armstrong indictment is unusual, the practice is widespread in the coal industry, Jamieson reports. University of Michigan chart; click on the image to enlarge it. 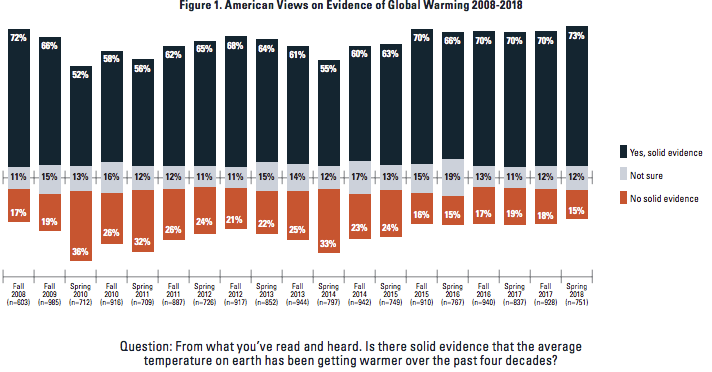 The percentage of Americans who believe in global warming is at a 10-year high, and more than ever believe human activity has caused or increased it, according to new polling by the University of Michigan and Muhlenberg College. A record high in their joint polling efforts, 60 percent, say they see some level of human influence and 34 percent say humans have a direct influence on the climate, Ben Geman reports for Axios. The percentage who see "solid evidence" of global warming is 73 percent, about the same as it was a decade ago; that number dipped into the low 50's and mid-60s between 2009 and 2015. However, the gulf between the attitudes of Democrats and Republicans is as wide as it has been in this poll since 2008. Among Democrats, 90 percent believe there is solid evidence of global warming and 78 percent believe humans are at least partially responsible. Among Republicans only 50 percent believe in global warming and 35 percent believe humans have an effect on it. New Jersey could become the first state to provide funding for local journalism, though it's not a done deal. "Last month, both houses of the New Jersey legislature passed the 'Civic Info Bill.' The bill sets up a nonprofit group that will be supported by five of the state's universities. A board of directors will approve grants to strengthen local news coverage," Brain Stelter reports for CNN. Gov. Phil Murphy signed a state budget Sunday night that allocates $5 million for the effort, but he hasn't signed the authorization bill. The Free Press Action Fund, a liberal public interest group, has been lobbying for such a bill for more than two years, on the grounds that print newspapers are losing staffing and resources and digital start-ups aren't filling the void. "In New Jersey, this is compounded by the fact that the state is located between two big cities, New York and Philadelphia, that are in other states. 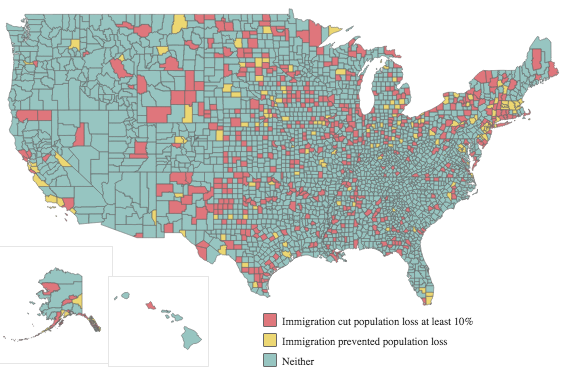 The practical effect: Less coverage of hyperlocal issues," Stelter reports. "So advocates and state lawmakers argued that public funds should support 'civic information' -- news coverage, yes, but also things like databases and media literacy initiatives." NEW YORK – Rural jails have grown more crowded even as urban jails have become less so, creating problems for rural jurisdictions, rural journalists heard on the first day of a project aimed at focusing more local news-media attention on the problem facing many rural communities. “In the last couple of decades, mass incarceration has metastasized from the largest cities to almost every community in America,” Christian Henrichson, research director for the Center on Sentencing and Corrections at the Vera Institute of Justice, said at “Rural (In)Justice: Covering America’s Hidden Jail Crisis,” a conference held by the Center on Media, Crime and Justice at the John Jay College of Criminal Justice in New York City. Lack of mental-health treatment: Several speakers said states that closed mental hospitals in favor of community-based treatment haven't adequately funded treatment, especially in smaller communities. Judge Steven Leifman, who has helped reform the jail in Miami-Dade County, Florida, said the mentally ill are nine times more likely to be incarcerated than they are to be hospitalized, and 40 percent of the mentally ill will have contact with the criminal-justice system. Increasing length of pre-trial detention: “Almost all of the jail growth in the U.S. since 2000 has been in pretrial detention” of unconvicted inmates, said Cherise Fanno Burdeen, CEO of the nonprofit Pretrial Justice Institute. She said most can't afford their bail bonds, raising questions about how bonds are set, the policies and lobbying of the commercial bail-bond industry, and the decisions of prosecutors and judges, which may be harsher on the accused in rural areas. Some inmates stay in jail because they can't afford even “incredibly small bail amounts,” said G. Larry Mays, Regents Professor Emeritus of Criminal Justice at New Mexico State University and author of Trouble in the Heartland: Challenges Confronting Rural Jails. In such cases, he said, it would make more sense for the jail to loan the inmate the money for bail. “Jails in rural counties suffer from both political conservativism and fiscal conservativism,” he said. In many states, the crowding of jails has been worsened by state laws or policies that put lesser felony offenders in jails, not prisons that offer rehabilitation. Larry Amerson, former sheriff of Calhoun County, Alabama, said 250 of the 600 prisoners in his jail would in earlier years have gone to state prisons, and the state pays the county only $1.75 per inmate day. Washington Post reporter Kristine Phillips, refreshing her previous beat at The Indianapolis Star, said Franklin County, Indiana, population 22,000, is among many struggling to provide mental-health treatment for state prisoners. Several speakers said journalists can play an important role in bringing such issues to public light. Burdeen said polls have shown people are generally unaware of the issues, but when told about them, say they are concerned. "We wouldn't be here today if it weren't for journalists," she said. This report also drew on the work of Marianne Dodson and Dane Stallone, interns at The Crime Report, published by the Center on Media, Crime and Justice at John Jay College. The Institute for Rural Journalism and Community Issues, publisher of The Rural Blog, assisted the Center with the conference. U.S. Department of Agriculture chart; click on the image to enlarge it. U.S. farmers are making more money than ever from oil and gas rights on their lands, especially in petroleum-rich states like Oklahoma, Pennsylvania and Texas, Claudia Hitaj reports for Amber Waves, a publication of the U.S. Department of Agriculture. Almost 67 percent of oil and gas extraction is from farmland; in 2014, that meant $3.8 billion in payments for farm operators who owned $19.1 billion in oil and gas rights, up 69 percent from 2005. "Total payments accounted for 11 percent of net cash farm income in oil and gas counties across all states, and about 30 percent in Oklahoma, Pennsylvania, and Texas," Hitaj reports. "Respectively, these states received about $1.2 billion, $0.6 billion, and $0.5 billion in oil and gas payments." Many farmers do not own the oil and gas development rights on their land; separate ownership of such rights is common, especially in areas with a history of drilling. In 2014, about 5 percent of farm operators nationwide and 11 percent in oil-rich areas reported owning oil and gas rights with positive value. In Oklahoma and Pennsylvania that number rose to 14 percent, Hitaj reports. Most payments are in royalties, typically one-eighth of the value of production, but landowners usually also get a one-time, up-front payment for leasing their rights. Streams and rivers in Appalachia must be protected to assure clean water for residents, but it's a tricky issue: "The same extractive and chemical industries that bring much-needed jobs and investment into this historically under-employed and over-exploited region also often carry with them environmental risks that materialize into illness and pollution, the causes of which are not only hard to fix, but often difficult to detect, or prove liability of in court," Jan Pytalski reports for West Virginia Public Broadcasting. Meanwhile, some Appalachian communities have discolored, polluted, or entirely absent tap water because of the very companies that bring jobs to the area. Lack of regulatory enforcement may contribute to that. "In recent years, the Environmental Working Group, a non-profit based in Washington, D.C., published a report that demonstrated a decades-long lack of enforcement on the part of the regulators and revealed that the agency’s 'safety levels' might be misaligned to the real-world environmental damage they cause, meaning that in light of the latest research the levels once deemed safe may, in fact, be harmful," Pytalski reports. But even when safe levels for contaminants are known, it's still difficult to prove that mining and fracking operations are responsible for area health problems. It's a complicated issue, but EWG has created a searchable Tap Water Database that makes it possible to check the water quality for every zip code in the U.S. When Vivian Medina thinks of rural America, she thinks of a dilapidated barn and home down the street: the once-beautiful home is a "broken-down shell" and the barn looks ready to topple over. But Medina, a student at Tennessee Wesleyan University in Athens, began to feel ashamed, especially after listening to a lecture by Whitney Kimball Coe, director of national programs at the Center for Rural Strategies, about how negative and one-sided stories about rural America can hamper readers' ability to see a more balanced picture of rural life. "I was ashamed because I am a part of the problem," Medina writes for The Daily Yonder. "I think of these rural areas as dying, and I use it as motivation to go to school, to get out of my town. I don’t think of the ways I could help these towns. I don’t think of the opportunity there is to create. I only see the falling barn. I only see the arrests for meth. I only see one story." If everyone saw the problems in rural areas and decided to run, rural problems only get worse, she continues. But there is "such a great opportunity to help" rural America, even if it's "just by dumping the negative views of these rural areas. Even if it's realizing that there is more than the two severe points on the spectrum, that the middle ground exists and should be acknowledged." Read more of Medina's insightful essay here. A jury awarded more than $25 million to a couple in North Carolina in a lawsuit against Smithfield Foods, the world's largest pork producer, for the smell, files, loud trucks and other nuisances related to living next to one of the company's hog farms. The plaintiffs, Elvis and Vonnie Williams, live in Duplin County in the southeastern area of the state. "The verdict came on Friday after the jury deliberated for three days behind closed doors. It is the second verdict for hog farm neighbors in a series filed against Smithfield," Anne Blythe reports for The News & Observer in Raleigh. "The decision also comes in a week in which North Carolina lawmakers adopted a new Farm Act that restricts when and how neighbors can bring such claims in court in the future." The verdict is significant for North Carolina, which has more hogs than any other state besides Iowa. That's why it's also likely to be appealed, which could reduce the amount of the award. The North Carolina Pork Council said in a statement that the verdict is "heartbreaking and could have severe and unforeseen economic consequences for our farmers, the pork industry and all of North Carolina agriculture," Blythe reports. Mostly due to rising demand for almonds, the average beekeeper now makes more money by renting colonies for pollination than through honey sales, Peyton Ferrier reports for Amber Waves, a publication of the U.S. Department of Agriculture. For more than 100 years, apiarists have rented bee colonies to farmers to increase yields of melons, orchard fruits and other crops. Pollination service fees for almonds doubled around 2004, when growers began planting more trees, and more densely, to meet increased demand. In 2016, almond growers accounted for 82 percent of all U.S. expenditures on pollination. Most almond orchards are in California's Central Valley region. "As the crop’s demand for pollination services has outstripped local supply, farmers have paid high fees to bring in colonies from cross-country distances for the February bloom," Ferrier reports. 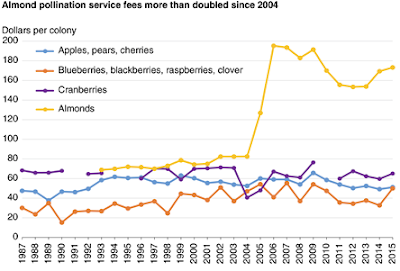 "At 5 percent, the pollination-services share of all farm costs is far higher for almonds than for most other crops (about 1 percent)." "Most nursing homes had fewer nurses and caretaking staff than they had reported to the government for years, according to new federal data, bolstering the long-held suspicions of many families that staffing levels were often inadequate," Jordan Rau reports for The New York Times. The daily payroll records, gathered by Medicare and analyzed by Kaiser Health News, show for the first time "frequent and significant fluctuations in day-to-day staffing, with particularly large shortfalls on weekends. On the worst staffed days at an average facility, the new data show, on-duty personnel cared for nearly twice as many residents as they did when the staffing roster was fullest," Rau reports. New York Times map; click on the image to enlarge it or view the interactive version here. Though it may seem counterintuitive, history and economists say that exporters usually end up losing when tariffs are imposed on imports. And though it's early, that seems to be what's happening to U.S. exporters under President Trump's new tariffs: "Soybean farmers face plunging prices as China raises tariffs, Harley-Davidson will move production of motorcycles destined for the European Union out of the U.S., and BMW says foreign retaliation may hit exports from its South Carolina plant," Greg Ip reports for The Wall Street Journal. Though the phenomenon was known as far back as the 1600s, economist Abba Lerner proved in 1936 that an import tariff is tantamount to a tax on exports. That link was especially strong while the U.S. was still under the gold standard, but is still holds sway. "If the U.S., for any reason, cuts its imports from a trading partner, that country’s economy and currency both weaken, so it buys less from U.S. companies," Ip reports. "If a tariff generated significant new demand for the protected American sector, the resulting boost to prices and jobs would put upward pressure on inflation, interest rates and the dollar, further hurting exports. Click here for more on how tariffs have historically affected commerce and what's likely to happen next in the U.S. Since the 2016 election, journalists have published countless pieces on what makes rural America tick. And so have authors, in the slower cycle of book publishing. Kentucky writer Silas House's new novel, Southernmost, is a provocative entry in this wave of Trump-era literature, examining not just the faith of rural evangelicals, but their works. The book centers on Pentecostal preacher Asher Sharp, who is horrified when his wife insists they turn away a gay couple after a catastrophic flood, one in which the couple saved some church members. Sharp, who had rejected his own gay brother years before, realizes how much his heart has changed and leaves his wife, which puts him in danger of losing custody of his beloved son. So Sharp kidnaps his son and takes off for Florida, to find his brother and evade his ex-wife. "What follows is a fast-paced page-turner, a story of redemption with many twists, turns and surprises. It also is a well-written exploration of the complexities of faith, humanity and how hard it can be to change long-held beliefs," Tom Eblen writes for the Lexington Herald-Leader. 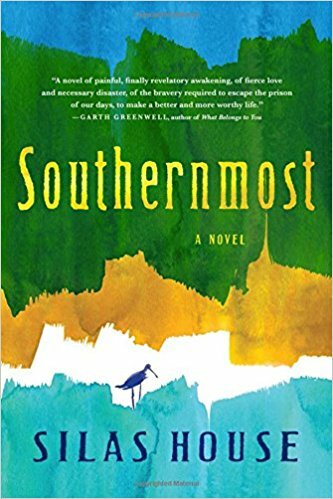 Southernmost is more than a good tale; it's a rebuke of modern evangelical Christianity and a scream of frustration at "faith without works." 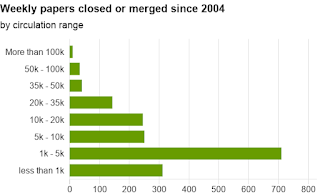 A recent research paper by Bill Reader of Ohio University on the population of U.S. newspaper presumed that most of the 1,639 weekly newspapers that closed between 2004 and 2016 had small circulations. That is confirmed by the continuing research of Penelope Muse Abernathy and her colleagues at the University of North Carolina, charted by the BBC in a report on U.S. newspapers. Most papers have small circulations; weeklies average less than 5,000. 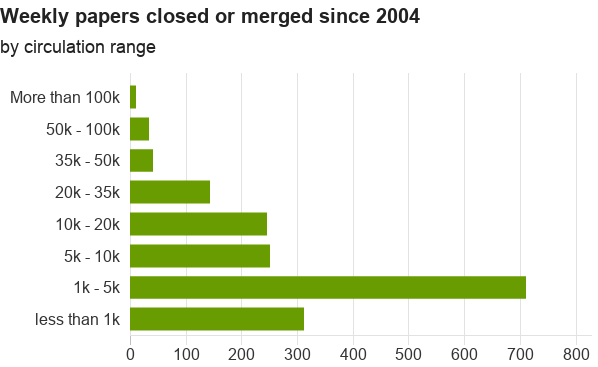 The Beeb's story is mainly about the downsizing, merger or closure of local dailies, using The Daily Camera in Boulder, Colo., as its object example. But some of the ramifications of those phenomena are probably also true of weeklies: less coverage of elections, less civic engagement, higher costs of government borrowing and "growing blind spots in health," a concern raised by epidemiologists. "When local papers cut coverage there's essentially nothing to take its place in these local communities," political scientist Danny Hayes of George Washington University told the BBC's Taylor Kate Brown. 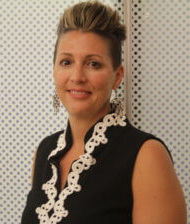 Abernathy has some points, as described by Brown: "Local news sets the agenda for public debates by bringing particular issues to public attention, encourages regional business development by connecting local businesses with local residents (whether through ads or coverage) and can reflect what's similar or different about a national problem on the local level." Abernathy said, "A strong local newspaper shows you how you are related to people you may not know you're related to." Brown ends her story with an appeal: "Local news in the US is on the decline - so how do you stay informed about your hometown? Send us your comments or questions to AskAmerica@bbc.co.uk and we will respond to what you tell us, as part of our 'Ask America' series." Pulitzer Prize-winning nonprofit InsideClimate News is inviting reporters in the southeastern U.S. to apply for its first regional training session for environmental reporting by Aug. 10. Ten winning applicants will attend the day-and-a-half training session in Nashville Sept. 24-25. No previous environmental reporting experience is required. The session is part of ICN's recently launched National Environment Reporting Network, and will include sessions on "extreme weather and climate science; how to find compelling and impactful environmental stories; how to search for public records and build sources; and other important journalistic skills and tools. You will also receive one-on-one coaching with award-winning ICN journalist James Bruggers, who runs ICN’s Southeast hub, to workshop and launch your story idea," according to ICN. Bruggers was a longtime environmental writer for the Louisville Courier Journal. Attendees will receive follow-up mentoring after the training session, and can apply to ICN for limited story development funds. Reporters will also have some opportunities for co-publishing on ICN's website.